Despite a double clash with the Wanganui races and an international rugby match at Spriggens Park, yesterday’s Grey Power-organised meeting drew 175 people to the Wanganui War Memorial Hall Concert Chamber. As in Nelson, over 90% of those present said they’d vote for a single-issue party dedicated to removing New Zealand’s racial roadblock. I should add that I really pleaded with them not to indulge me with a Yes vote unless they really meant it. I said I quite understood if, despite the importance of this issue, they saw the National Party’s economic policy or the Labour Party’s social policy as a higher priority. Yet despite my plea, only 5 said they would vote for one of the established parties. Next stop Havelock North on April 9, then Waikanae on April 22. Also Tim Wikiriwhi is arranging a Hamilton meeting (date to be advised), and I’ve accepted an invitation from Grey Power Hastings to discuss the constitutional review on July 7. I’m about to drive to Wanganui to get for tomorrow’s (Thursday) 2pm meeting in the War Memorial Hall. Grey Power president Graham Adams says feedback suggests we’ll get twice their usual audience and may fill the venue. Wanganui is not just famous for being given an optional ‘h’ over the protests of 80% of its residents. 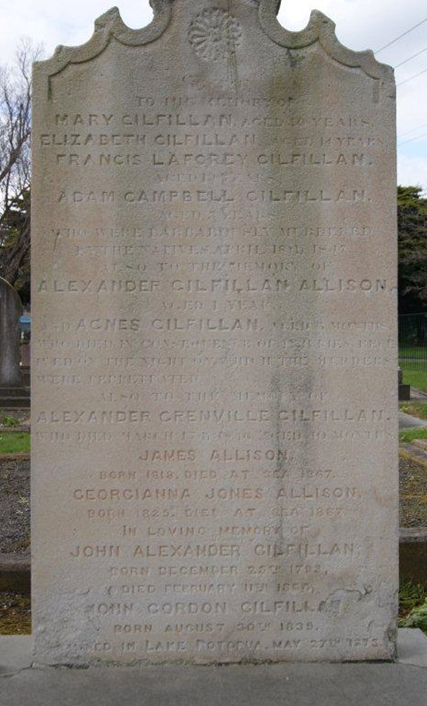 It was also where six members of the Gilfillan family were tomahawked to death (‘barbarously murdered by natives’, as the above family gravestone puts it) in 1847. Read for yourself the chilling testimony of Sarah Gilfillan. The butchering of the law-abiding farming family was typical of the Maori custom of avenging a small slight with the mass murder of innocents. in 1772 in the Bay of Islands, 27 French sailors were killed and eaten — supposedly for fishing in the wrong bay. in 1809 at Whangaroa, 66-70 men, women and children were killed and eaten — because one man had been flogged in error. 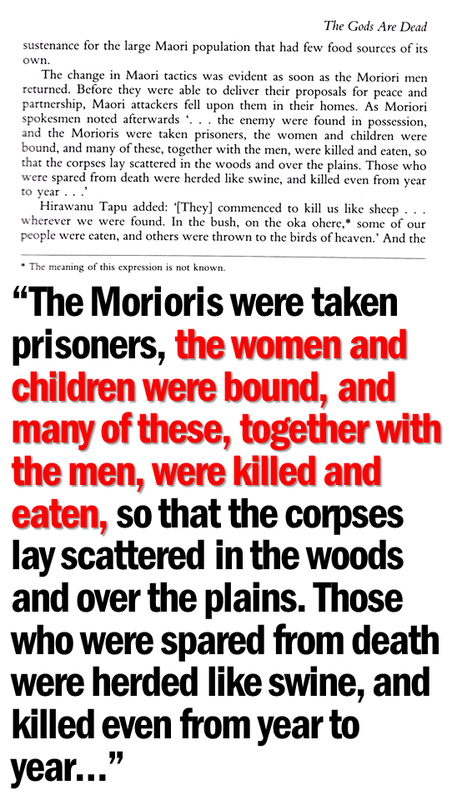 in 1868 at Matawhero, nearly 60 men, women and children were massacred by Hauhaus — because Te Kooti thought he’d been wrongly imprisoned. “a teenage midshipman [Crozier] … was paying chief Hapurona Ngarangi for a raupo whare on the beach, when a dispute arose over the price. Crozier went into the house, got a pistol and pointed it at Hoporona, trying to force his terms. Others did, however. And the victims they chose were the settler family furthest from town. While friendly Maori brought the four killers in and they were hanged, rather than accept this punishment rebel Maori used it as an excuse for more bloodshed. I hope to see you at the Wanganui War Memorial Hall at 2pm tomorrow. It’s a public meeting, so do email all your friends in the area. God’s Own Separatism: the Anglicans’ home page. 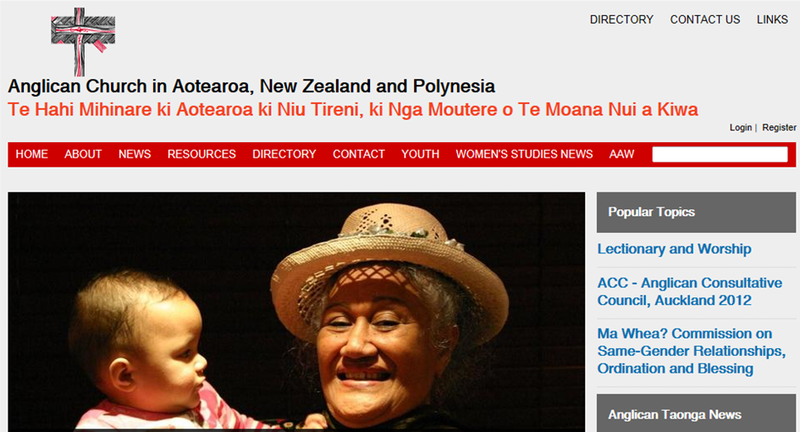 The prize for the most misleading use of the word Aotearoa must surely go to the Anglican Church in Aotearoa, New Zealand and Polynesia. Are the best brains of our biggest church really such sloppy punctuators? 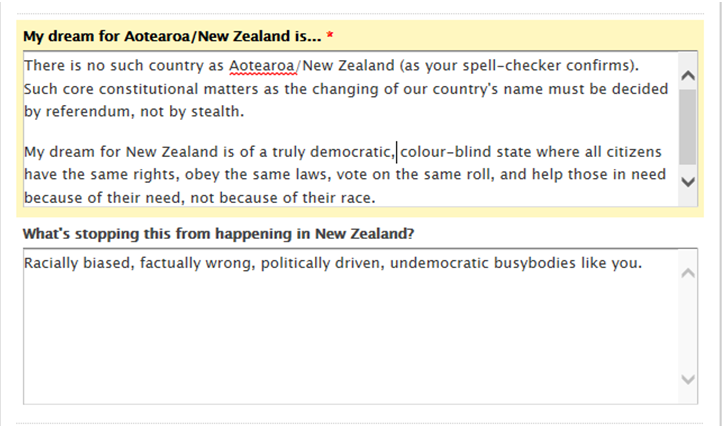 Or do they really believe that Aotearoa and New Zealand are two separate countries? In which case, which one is God’s Own? More to the point, does He really think it’s a good idea for His religion to be promoting racial separatism? 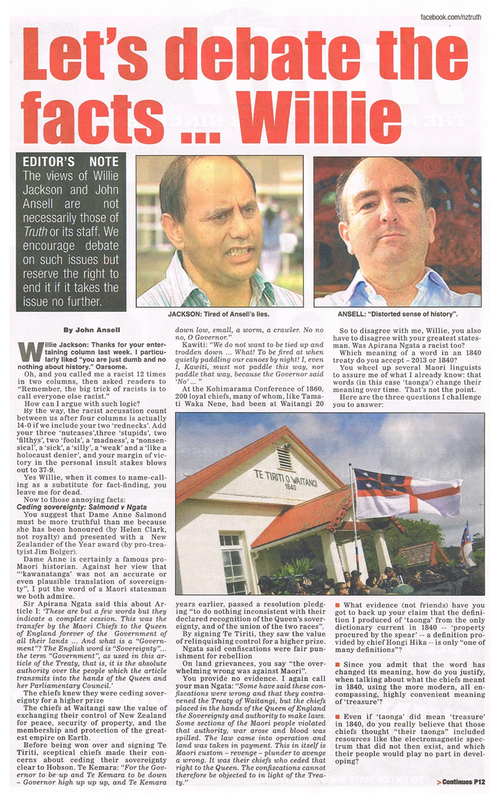 The appointment of a new Pakeha Archbishop reminds us that the Anglicans are running an apartheid system in New Zealand. Philip Richardson, the Bishop of Taranaki, was confirmed as Archbishop-elect at a meeting in Wellington of representatives of the country’s seven Tikanga Pakeha dioceses. From May 1, Bishop Philip, who is 55, will become one of three Archbishops leading the Anglican Church of Aotearoa, New Zealand and Polynesia. As Archbishop, he will work alongside Archbishop Brown Turei, who leads Tikanga Maori (the Maori cultural stream of the church) and Archbishop Winston Halapua, who is the Bishop of Polynesia. 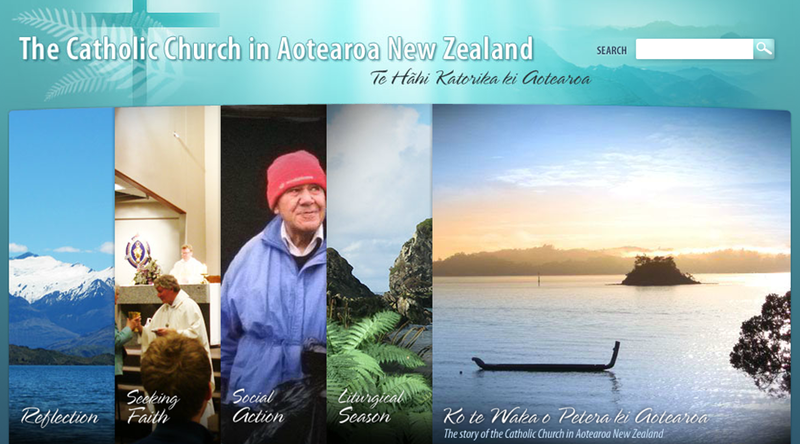 The church’s website doesn’t say where Chinese, Indian, West Indian or Somalian New Zealanders are supposed to worship. Presumably with a less racist denomination. 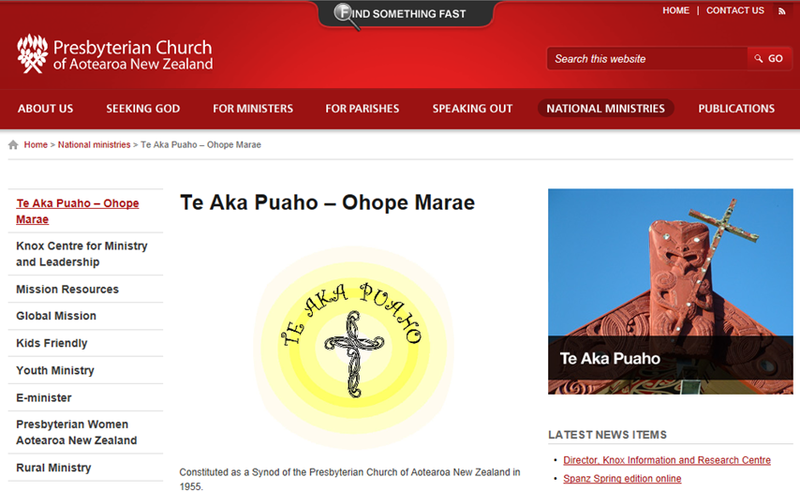 While the Anglicans wrongly believe Aotearoa and New Zealand are separate countries, the Presbyterians and Catholics wrongly believe they’re the joint name of the same country. Duncan wants to talk to me about Race Relations Day and Dame Susan Devoy’s appointment as Race Relations Commissioner. I don’t really know Dame Susan’s track record in this area, only that she comes from Rotorua and played superb squash against people from many different cultures. 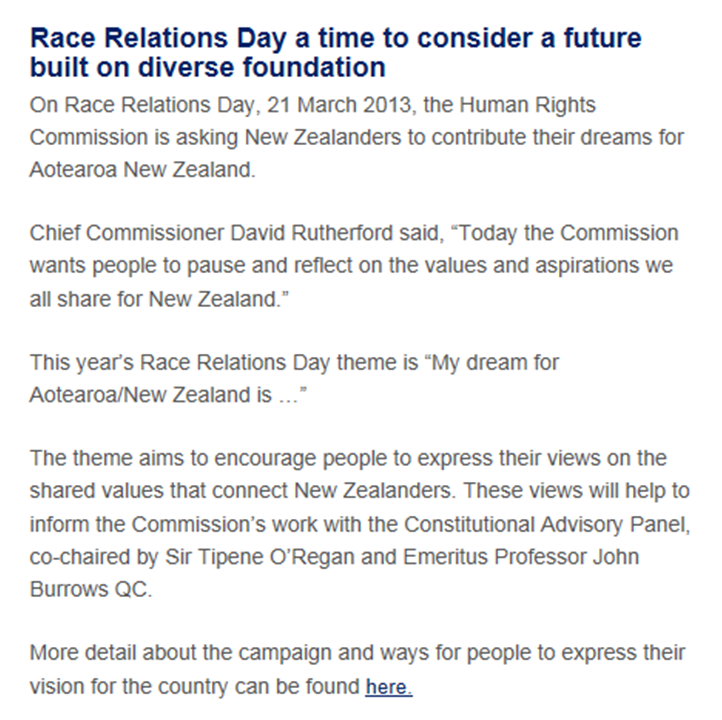 According to the Human Rights Commission, today is Race Relations Day in ‘Aotearoa New Zealand’. Ironically, it’s also my birthday. And do I — a man Willie Jackson would have you believe was New Zealand’s arch-racist — want good race relations? Yes I do. Of course I do. Don’t we all? But we won’t get them while self-important bureaucracies like the HRC think they can ride roughshod over the democratic process and change the name of our country without the people’s permission. And so I do not have any dream for Aotearoa New Zealand. Aotearoa New Zealand, to me, is a nightmare — a make-believe, politically correct la-la land controlled by a minority of a minority, based on emotional blackmail and the rewriting of history to suit themselves. Why don’t you tell them yours? Thanks to Racheal for the links. Drought crisis: Will Nats take emergency measures and enact their own principles? Does it take a drought to force National to do the right thing? Will it take the prospect of a $1-2 billion economic thumping for the party to enact its founding promise to work for all New Zealanders? Or will our growth rate have to plummet by 30% before National keeps its ‘one law for all’ promise that Bill English and Don Brash promoted, and John Key campaigned under, then reversed? “The latest advice is that somewhere between $1 billion and $2 billion will be knocked off our national income. And as every week goes by, the prospect of it being $2 billion instead of $1 billion grows”. Bill, it also highlights the stupidity of siphoning off between $1 billion and $2 billion every year and giving it to one racial group only. It highlights that you and Don were right to want to stop race-based spending, and John was wrong. As you and John must know, Maori privilege payments are costing us about the same as your $1-2 billion 2013 drought deficit prediction — and your $1.7 billion 2010 South Canterbury Finance bailout — every single year. It’s been costing us that much for decades — including when you were last in government. So Bill, don’t waste this crisis. The drought gives you just the excuse you need to implement your own policies. Now is the time — before it rains too much. Now is the time for National to do the right thing. 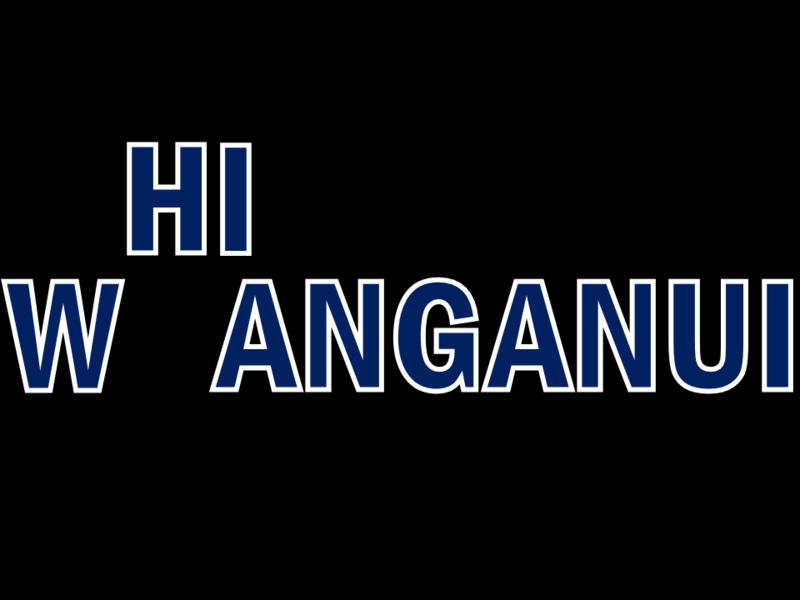 Not for nothing, you may conclude, does the ‘tangi’ in ‘Waitangi’ means ‘weeping’ or ‘mourning’. But the Waitangi in this story is not in the Bay of Islands. It’s in the Chatham Islands. It, too, is a place of grievance. And the perpetrators of that grievance were not white colonists from England, but Maori invaders from Taranaki. Reporting on that troubled province, the Tribunal named after the northern Waitangi described as a ‘holocaust’ the Crown’s response to Taranaki tribal rebellion and Treaty-breaching. Chronic tribal exaggerators like Tariana Turia and Kerry Opae even apply the term to the Crown’s repossession of its own land at Parihaka — after 14 years of asking nicely — where the death toll was precisely zero. But they’re right that there certainly were Taranaki-related ‘holocausts’ (as in mass murders of innocents) in the 19th century. And all of them were perpetrated by Maori. the rebels’ burning of the homes of 187 farming families. the cruel, unprovoked murders of settler men, women and children like the Gascoigne family, the Gilfillan family, and Rev. John Whitely. the hijacking in 1835 by 900 of that other Taranaki third, of a ship to the Chathams, and the ethnic cleansing of the peace-loving Moriori. 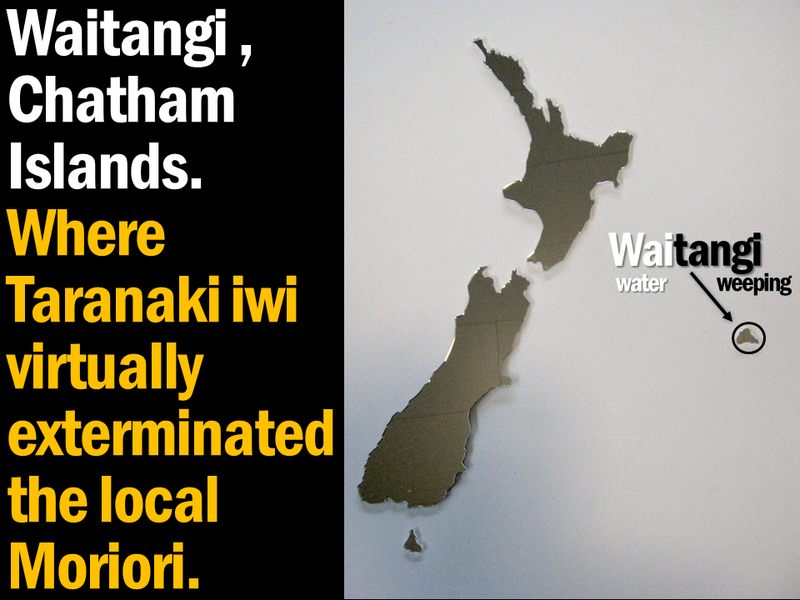 The bloodiest killing field of those Taranaki butchers (from the Ngati Tama and Ngati Mutunga tribes, that recently received millions in Treaty settlements) was a beach called Waitangi. Isn’t this the Waitangi-related grievance we should be most concerned about? My first Hawkes Bay meeting is now confirmed for 7pm on Tuesday April 9 in the Havelock North Community Centre, 30 Te Mata Road. Organising the April 9 meeting is none other than Hawkes Bay Ranfurly Shield era player, captain, coach and administrator Dr Tom Johnson. Tom is a serial winner and a great guy. As well as having leadership roles with Lion Breweries, Europa Oil, Hawkes Bay Racing and the NZRFU, he founded Golden Oldies rugby, the biggest sporting festival in the world. Tom will hate me for this, but below is Tom being awarded his MNZM by Sir Anand Satyanand. And here’s a recent story about him completing his PhD at the age of 74. And the man who led Chris Tremain’s campaign team in 2005 when he defied the odds to win Napier for National was…? You guessed it. Tom’s done a lot of winning. He’s studied a lot of winners. And he’s going to help us win. 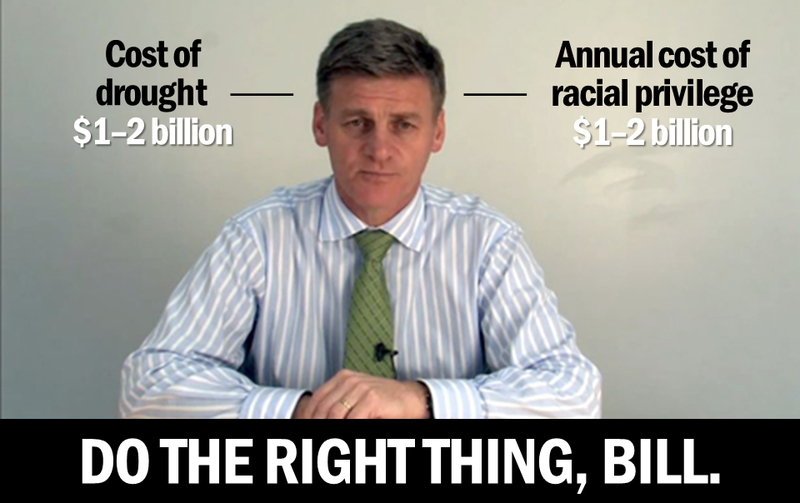 Believe it or not, he’s committed to spending the rest of his life working for a racially equal New Zealand. Isn’t that amazing? He says he’s doing it for his grandkids. He’s doing it by conquering Hawkes Bay one Rotary Club and Probus Club at a time. He’s already given his talk ‘The Elephant in the Room’ to three clubs, and is getting an overwhelmingly positive response. I hope I can get the same on April 9. Oh, and to say that Tom is now disillusioned with the Nats is putting it mildly. He’s one of six former National Party chairs that I’m in touch with, and they all say the members have had a gutsful of Key and Finlayson’s surrender of New Zealand by stealth. I hope to see you at the Havelock North Community Centre on Tuesday April 9, and/or when I return to the Bay on Friday June 7. Tell all your friends that the pushback has started, and let’s have a great night. I’m grateful to Grey Power Wanganui for hosting my meeting at the big War Memorial Hall on Thursday 28 March. GREY POWER PRESIDENT: Hi, Graham Adams, President, Grey Power Wanganui. and help those in need because of their need, not because of their race? At 2pm on Thursday 28 March in the War Memorial Hall, hear John expose what he calls the ‘Treatygate’ fraud, and his solution to the appeasement policies of our government. John Ansell, 2pm, Thursday 28 March, in the War Memorial Hall. With those 90 spots, plus the newspaper story, plus a full page exhortation sent to 1300 Grey Power members — plus all you good people sending this link to all your friends 🙂 — Grey Power and I think we stand a good chance of filling the 350-seat Concert Chamber. For balance, Graham Adams tells me that Grey Power will also be hosting Peter Tennent of the Constitutional Advisory Panel at a meeting in July. I hope to attend that meeting too, and urge all Wanganui readers to join me. But first, please start beating the drums about the 28th — two weeks from today. The next day is Good Friday, but let’s make it an Even Better Thursday. A big thank you to Grey Power Wanganui for accepting the challenge of showcasing this important issue. I now challenge all other Grey Power branches to do the same! 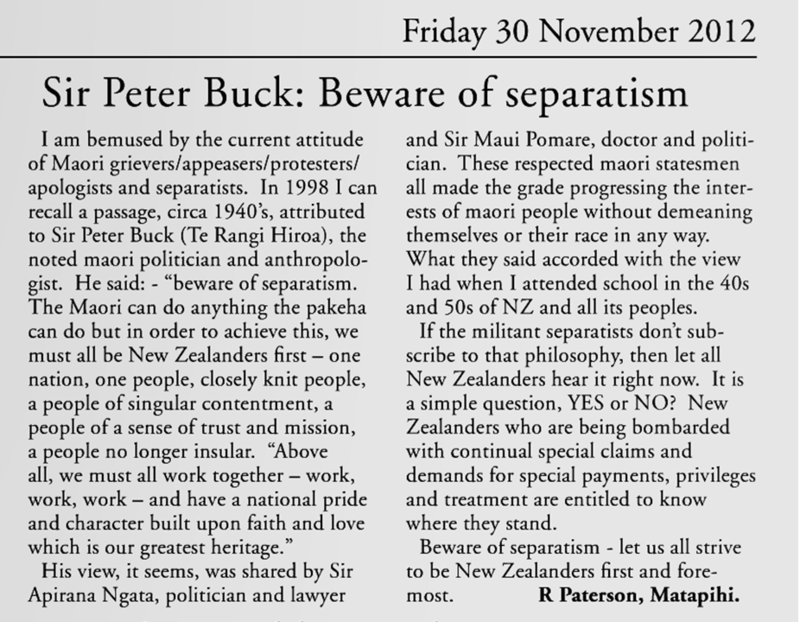 Thanks to R Paterson for writing this letter to the Tauranga Weekend Sun. It reminds us why demanding racial equality is such a noble thing to do. 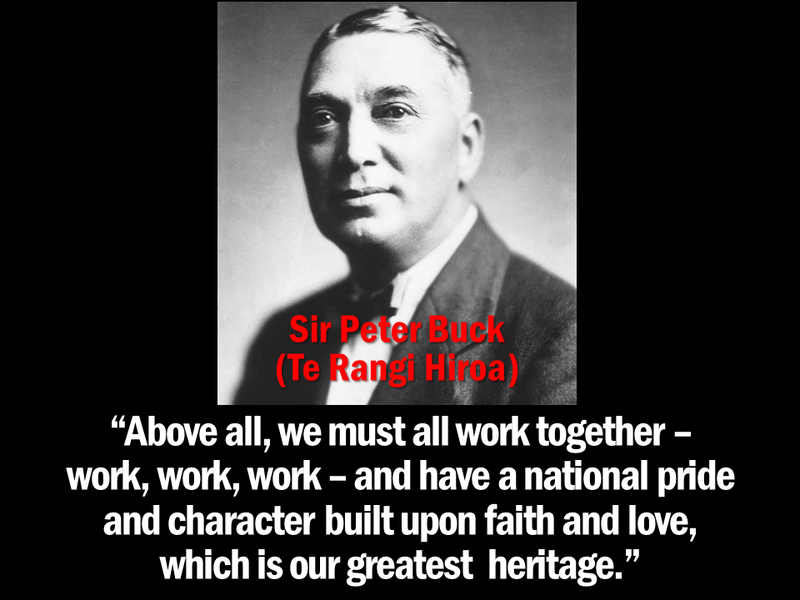 In doing it, we’re echoing the call of the most aspirational of Maori leaders, those shining knights of old, Ngata, Pomare, Carroll and Buck. 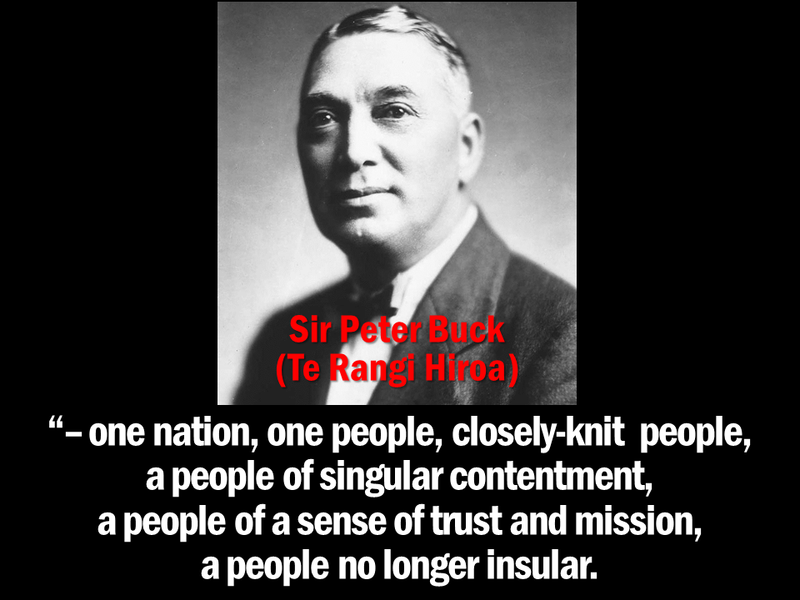 Can you imagine an iwi so-called ‘leader’ of today rallying his people with such a galvanising, Churchillian appeal to their higher purpose? 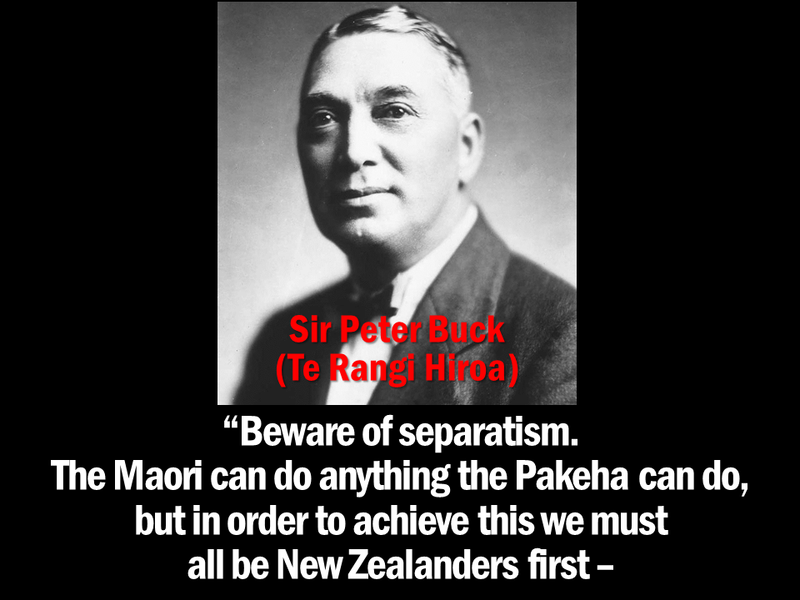 Can you imagine the contempt with which the visionaries of the early 20th century would have held the Harawiras, Sykes, Mutus and Jacksons, who are setting the Maori bar so low in the early 21st? Sadly, we can’t bring back Buck. But we should honour his memory, echo his hopes, and — whenever the chance arises — breathe new life into his words. 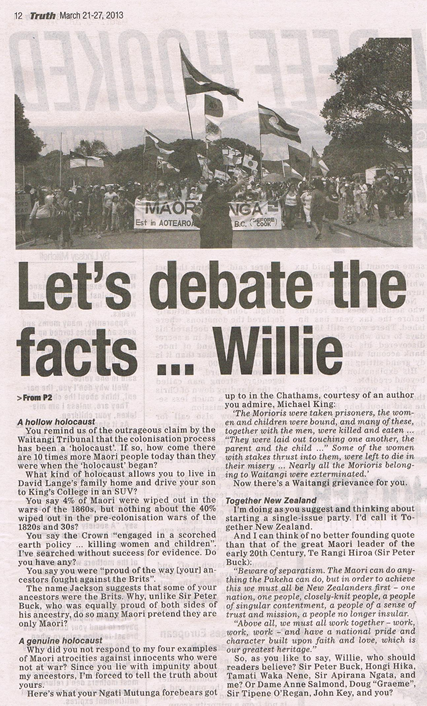 You may remember on Willie and JT’s radio show, a woman rang up bemoaning my grasp of Crown-Maori history. She had, it seems, been to university. And knew better. Quite what a history course at one of New Zealand’s bastions of biculturalism had to do with actual history, she didn’t say. She did, rather tellingly, point out that, of all the authors featured in her university library, only one — Stuart Scott — would have taken issue with the world according to Jackson and Tamihere. Which says it all about the impartiality of our state education system. I was surprised there were as many as one. I commended to her the works of half a dozen other authors that she should read for balance — a concept her professors would not have understood. She commended to me a book by Robert and Joanna Consedine called Healing our History — The Challenge of the Treaty of Waitangi. By a stroke of luck, I told her, I happened to be reading that book at the moment. I was also reading the new bombshell volume Twisting the Treaty — A Tribal Grab for Wealth and Power. And it occurred to me that these two books, with their oddly symmetrical titles, really serve as manuals for their respective sides of the Treaty debate. Then Dr John Robinson, one of the authors of Twisting the Treaty — as well as The Corruption of New Zealand Democracy and When Two Cultures Meet — told me that he, too, was reading Healing our History. I asked what he thought of it. This was his reply. This book has been referred to as the definitive Treatyists’ manual. Reading it took me back to the last time I attended a seminar at the Treaty of Waitangi Research Unit at Victoria University, more than a decade ago. That seminar, on the Treaty of Waitangi as presented by the Treaty bus then touring the country, took the form of a true believers’ revivalist meeting, leaving me extremely uncomfortable. praise from the Treatifarians’ patron saint Claudia. The speaker preached the dogma, and there was no intelligent comment. That was far from a true university, where questions are asked and information is tested. This book has the same credulous feel about it, as if preaching to the converted. But when questioned, much of the argument is seen to be specious. That Unit depended on the goodwill of the Waitangi Tribunal and the Crown Fisheries Trust for funding, and Director Richard Hill had to keep in their good books to assure his employment and promotion to Professor. We were all expected to join in the Church of Treaty Grievance. This is a sad book, for Robert Consedine is a fine person, who has done much to aid people in need. all non-Maori (but not Maori with European blood) should carry a guilt trip. Along with that is an acceptance of the recent rewriting of the Treaty of Waitangi. This has been transformed from a document setting up a united nation to a blueprint for separatism and partnership between two divided races — with different laws for each, and different rights. I comment on some of the points in the book that supposedly build the case for a belief in white wrongdoing, with its severe critique of colonisation. These illustrate the Consedines’ habit of accepting anything that suits their cause. The simplistic treatment of an always-bad colonisation intermingles some five centuries of actions by different peoples, as if this was a uniform continuity, and all Europeans the same. Here the British actions in 1840 are confounded with the horrors of other colonisations, such as Cortez in Mexico, Pizzaro in Peru, and the later Belgians in the Congo. The Age of Enlightenment and the British fight against slavery are ignored. That evolution of an enlightened and inclusive policy is outlined in the chapter ‘British Society at the Time of Meeting’ of When Two Cultures Meet — The New Zealand Experience. We should be proud of British colonisation, how it was carried out, and what was achieved. The history of New Zealand and of the Treaty of Waitangi has nothing in common with the much longer and particular story of the British in Ireland. The Consedines’ aim here is to blacken the name of the British as “the colonisers”, with stories of claimed wrongs in other places, and not to tell the real story of what British intentions were in New Zealand, of Maori hopes for peace, or of the complex events leading up to and following 1840. Indeed, this is true, as according to the numbers in the table Maori households contribute more in tax than they receive in benefits and other fiscal transfers. But taxation is for a lot more than that, for a wide range of services (hospitals, police, schools, etc.) — not only for benefits. And that considerable range of services is NOT well supported by Maori. The great majority of the taxes from Maori are taken straight back by benefit payments – $2.31 billion of $2.40 billion, or 96%. The result is that Maori provide (after benefit payments are returned to them) $92 million of general cost taxation, compared to $20,982 million from non-Maori. Maori (10% of the population or more) provide just 0.44% of non-benefit taxes for governance and public services. That is not a fair share. 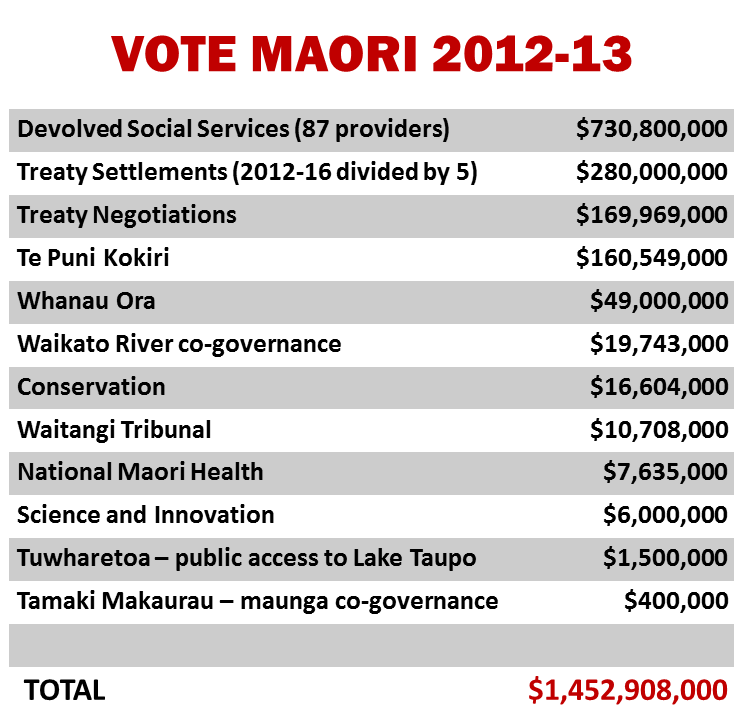 Another way of commenting on the numbers is that Maori take back almost all of their taxation in benefits, and make a negligible contribution to the cost of government services, which they receive, and which are almost completely financed by non-Maori. The NZIER claims that such “conclusions transform the frequently promoted myth that Maori are a drag on the New Zealand economy”. Surely this shows the very opposite. There are many such examples of ridiculous statements that are readily accepted and repeated until they become part of the new history. In this, as in so many ways, the Consedines do a great disservice by failing to question such spin. Too many ‘authorities’ get away with telling porkies, and are well paid for doing so. The killing by Maori of around one-third of the Maori population in the horrific intertribal warfare of 1800 to 1840 is downplayed. “Lawyer R D Crosby estimates that between 50,000 and 60,000 Maori were killed, enslaved or forced to migrate from 1810-1840. Pool’s suggestion that the killing of around one-third of the population in that savage warfare in 30-40 years (with a considerable proportion in the one decade of the 1820s) had no great impact on population or life style, is simply incredible. But if an authority figure says so, it must be true to the credulous believers. I have dealt with this at some length in my When Two Cultures Meet — The New Zealand Experience. Not because such nonsense should be taken seriously. But because Pool has been believed without any question raised. From an examination of the data, and many eyewitness accounts, it is easy to determine the consequences of that killing — which was a great demographic imbalance that had an impact throughout the remainder of the eighteenth century. The cause of Maori population decline through the whole of the eighteenth century was that intertribal war. Not colonisation. Indeed, the Treaty and assertion of British sovereignty brought an end to widespread intertribal warfare — as well as to slavery, cannibalism and female infanticide. The desire by a number of Maori chiefs to put an end to that warfare by the introduction of a powerful central force was, in fact, a significant reason for the welcome given to the Treaty of Waitangi — and repeated at Kohimarama in 1860. This would suggest that any Maori poor health was a consequence of colonisation. It is false. Life expectancy for Maori was about 25 years before colonisation. The considerable effort by the British to determine land ownership fairly is an important, and significant, part of our history. The troubles were substantial, with claims by existing residents, returning freed slaves, returning warriors, and recent conquerors. While one person would own the land, a chief might insist that traditional control should continue. 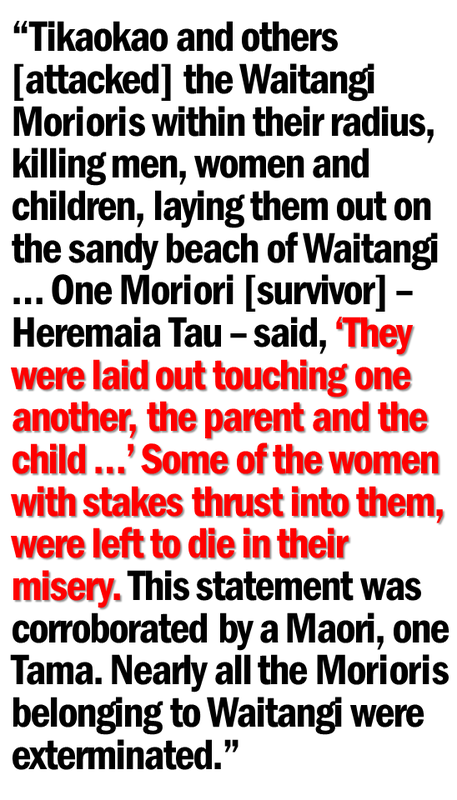 This is what happened at Waitara, where the disagreement was the consequence of a long-lasting feud among Maori. Thus Kingi wished to overrule Teira because Rimene had some years before seduced the wife of Ihaia. The full, complex and fascinating story is well reported in historical accounts. I have summarised much of this in When Two Cultures Meet — The New Zealand Experience, drawing on two very informative and comprehensive historical accounts. The Crown did not “take land”. It purchased from a willing seller, Teira — who even Kingi recognised as the owner. The rewriting of history cheapens a human story, and robs us all of a fascinating and often dramatic historical birthright. The standard modern version as given by the Consedines presents Government (called the Crown) action at Parihaka in 1881 as shameful. Yet the settlement of Parihaka under Te Whiti’s leadership was clearly illegal, as the land had been properly and legally confiscated — as punishment for rebellion. And many attempts had been made to negotiate with Te Whiti. 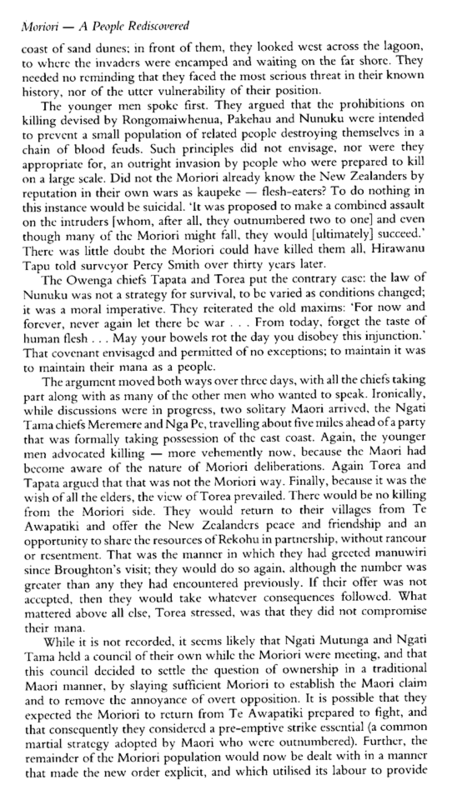 As with Waitara (above) and the writing of the Treaty of Waitangi (below), the full story is far more fascinating than the simplistic fabricated version, which was used by the Waitangi Tribunal to describe those events as “the pillaging of Parihaka” and an example of “the Maori holocaust”. The one casualty was a boy whose foot was trodden on by a horse. And far from being pacifist, there was at Parihaka a stockpile of around 250 weapons including breechloaders, Enfields, revolvers and a variety of ammunition. 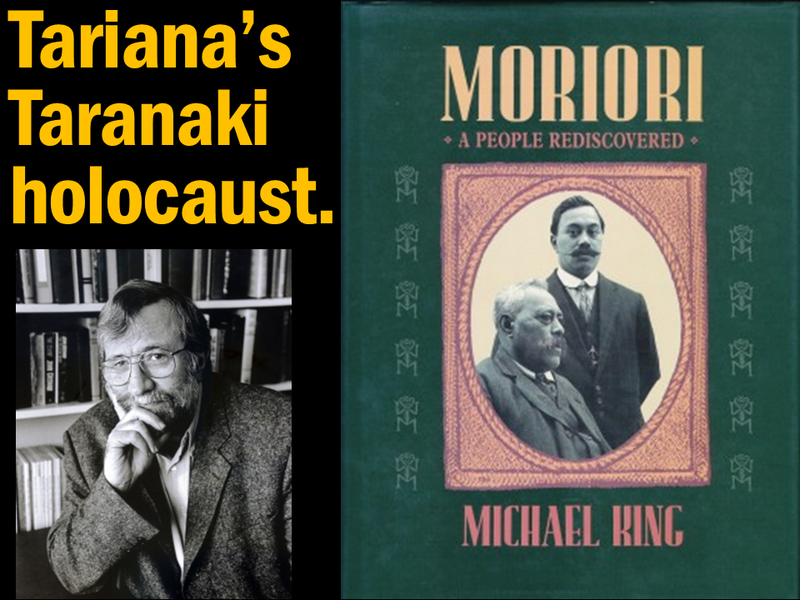 A comprehensive account is given by Bruce Moon in the chapter ‘Parihaka — The Facts’ in Twisting the Treaty –A Tribal Grab for Wealth and Power. The Consedines include (in Appendix 2) Te Tiriti o Waitangi 1840 in Maori, together with a translation into English, and “The Treaty of Waitangi: an English version 1840”. The translation is by Hugh Kawharu in 1973. It differs significantly from the many other translations in and after 1840, including that in an article by Sir Apirana Ngata in 1922. Kawharu altered the meaning of words, which were formerly clearly understood and agreed upon by all. There is no such thing as “an English version”. There is only one true version of the Treaty, and this is in Maori. The “version” given is a draft prepared by Hobson’s secretary, and dismissed by Hobson before the final English draft was prepared and then translated into the Treaty. That secretarial draft is a confusing document, and is internally inconsistent. On the one hand, British law is to apply. On the other, Maori are given control of “fisheries” — that are not privately owned in British law. How could Hobson have spent several years discussing and being advised on this Treaty, and then come up with such a mess? The answer is that he did not. 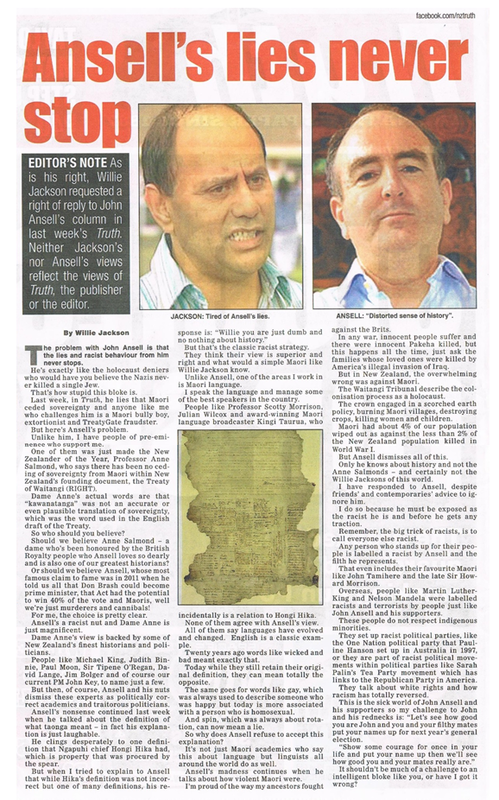 The full story is given by Bruce Moon in the chapter “Real Treaty: false Treaty, the true Waitangi Story”, in Twisting the Treaty — A Tribal Grab for Wealth and Power. 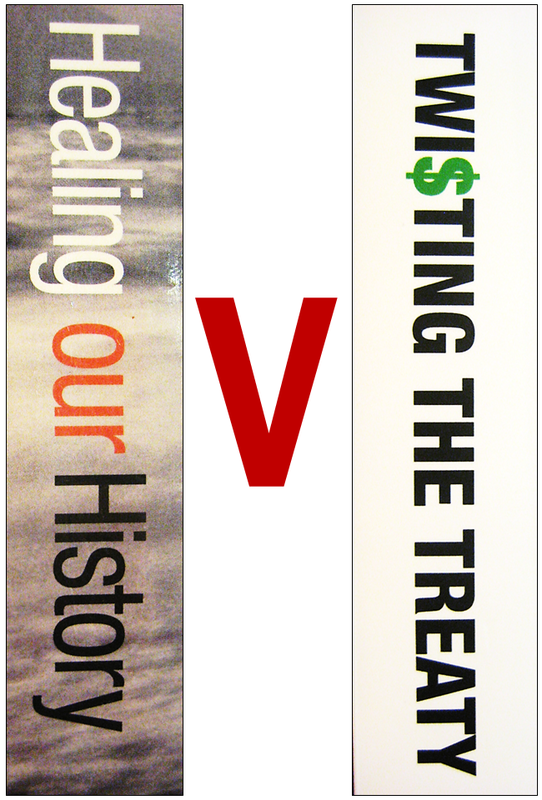 Healing our History — The Challenge of the Treaty of Waitangi is a lazy work, parroting the new accepted dogma of colonial guilt and blameless, hard-done-by Maori. The reality is far more complex, richer and more interesting. 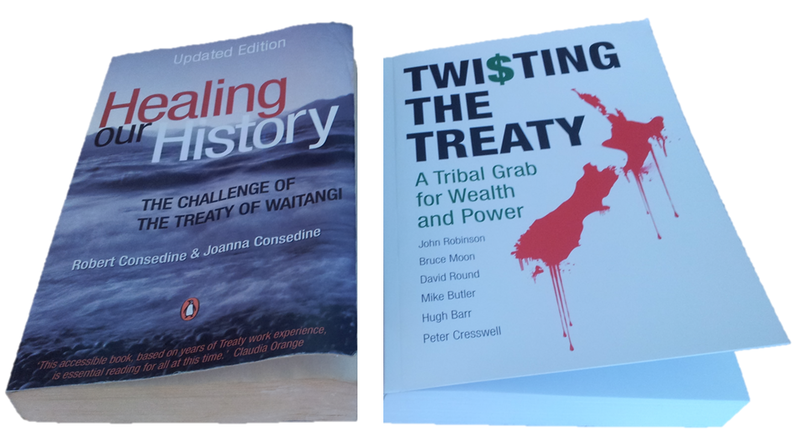 These and other important points have been treated in depth by the six authors, and the editor, who have contributed chapters to Twisting the Treaty — A Tribal Grab for Wealth and Power, which is essential reading for anyone with an interest in the Treaty of Waitangi. read both of these books. Thanks to John Robinson for another valuable contribution to the debate. If Robert and/or Joanna Consedine (or their endorser, Dame Claudia Orange, for that matter) would like to write a review of Twisting the Treaty, I’d be more than happy to run it! And if you haven’t grasped the hint from all my links, don’t forget to order your copy here. After reading the above opinion in last week’s Truth, I phoned editor Cameron (Whaleoil) Slater to say I was surprised he’d be party to smearing as a racist a person who advocates racial equality. 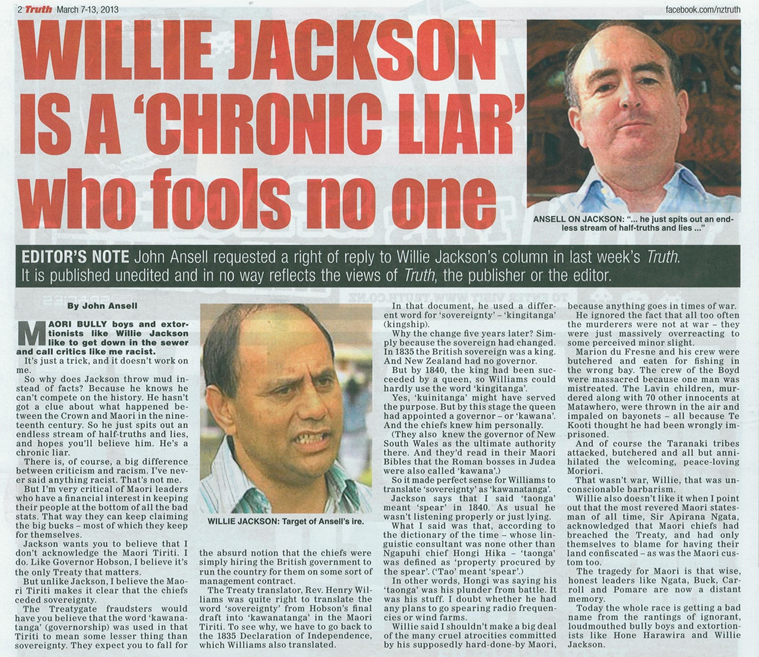 It’s not so much that Willie Jackson lies with impunity (and immunity, judging by the years of free airtime and column inches he’s had to spout his filth) — it’s that, on Treaty matters, he hardly ever tells the truth. He doesn’t tell it mainly, I suspect, because he doesn’t know it. So if we’re going to teach the public what really happened in the past — and how they don’t need to feel nearly as guilty as they’ve been told — we’ve got to push back against every one-eyed con artist like Willie. Thanks to Cam Slater for giving me the right of reply.